There is just no way that anyone should be able to make an entertaining movie about Pac-Man, and yet, here we are. Written, directed and starring James Farr, and produced by Steelhouse Productions, this short vignette is an effort to explain the otherwise non-existent plot behind Namco Bandai's classic arcade title Pac-Man, down to the tiniest inexplicable detail. 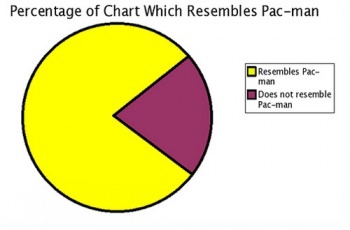 Did you know that "Pac-Man" is actually an acronym for "Polymorphic Autonomous Compound MANipulator?" Granted, that's totally not true, but at least it's some kind of explanation for the little yellow dude's name, right? It's more than the arcade cabinet ever gave us. Unlike yesterday's fan-made Mega Man X movie, this film takes far more liberties with its source material. While I realize that I railed against that kind of thing less than 24 hours ago, in this case I heartily approve, if only because it's obvious that the creators have genuine affection for the original game, and that all of the added bits of backstory are designed to fill in gaps, instead of replace the title's existing canon. This too is a better videogame movie than Hollywood is capable of creating. I'd also like to point out the almost TRON-esque feel of this clip. I don't know whether it's the graphics or the bewildered military guy, but something about this movie reminds me of Disney's beloved cult classic, and that seems incredibly fitting given that it's based on an arcade game that contributed to TRON's ambience, if not its sense of cultural relevance as a whole. Bottom line: This thing gets two thumbs up. Fun for the whole family.